If you’ve spent much time on my college blog, you already know that published college price tags are meaningless. Most students receive some type of price break, thanks to federal or state grants and/or discounts from the schools themselves. What is far more important than a sticker price is a school’s net price. A net price refers to the cost after all scholarships and grants are deducted. For instance, if you got into a university with a $30,000 price tag, but received a $7,000 grant from the school, along with a $2,000 state grant, the net price would drop to $21,000. The U.S. Department of Education wants families to begin thinking about net prices when they shop for colleges. As part of that effort, the federal government launched a new website – College Affordability and Transparency Center – this month that contains the names of schools with the highest and lowest net prices among public schools, as well as nonprofit and for-profit private institutions. On the site, you can also find schools with the highest and lowest price tags, as well as schools that have been increasing their tuition the fastest. 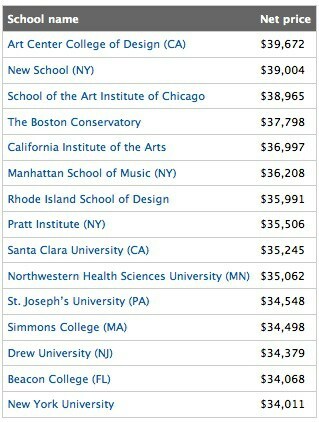 How do schools end up on the list of the highest net prices—a list with which no college wants to be associated? These schools charge extremely high tuition, but provide little in terms of financial aid to their students. 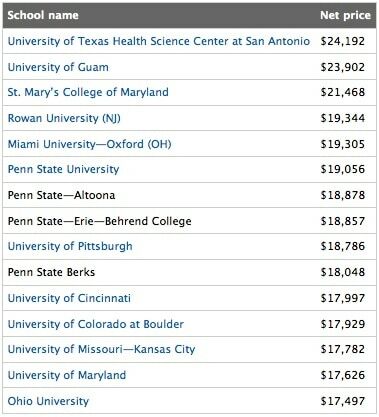 Among the state universities with the highest net prices, Pennsylvania universities stand out. You can find the other schools on these lists, along with other tables, by visiting the federal government’s new College Affordability and Transparency Center. Before you apply to any school, check out its net pricing. Can This Family Afford Syracuse University? Who Will Pay What for College? Is Graduate School Worth the Money? Lynn – in addition to grants and scholarships, most schools calculate their net price after subtracting self help aid as well (Stafford, Federal Work Study) for those whose submitted financial data shows they qualify. It will be interesting to see which schools will play the game of trying to show a lower net price by using the infuriating and (in my opinion) unethical practice of including the PLUS loan in their net price calculations (as some schools regrettably do in their award letters). For most of the schools that have posted net price calculators on the College Board site so far, I haven’t seen any that are including the PLUS Loan in their estimated awards. I wonder if that tactic has been addressed/forbidden by the DOE in its guidelines for how the schools are allowed to build their net price calculators. Thanks for your comment. Your raise an excellent question about whether schools will rig the calculators by including PLUS loans. I would think that would be forbidden. A PLUS loan can cover all the costs minus the grants and work study so that would be absurd to include. I also don’t think colleges should be including Stafford Loans either!